I’m back (after a long absence caused mainly by serious health problems) but not with the pictures I expected – black and whites on film taken either on the Olympus XA or XA4 or the Contax RTS II. Keeping up my (almost) daily journal of a 7,000+ km trip from Yorkshire to, in and back from Romania in our 43 year old VW camper, Lofty, meant that the Contax never came out of its bag, and I took very few shots, yet to be developed, on the XAs. The Facebook journal (Lofty2Romania) was just so much easier to keep up with pix taken on the iPad. It’s made me revise my approach to this blog. However, it’s not just the trip experience which is making me change my approach; I discovered a blog and Instagram photos from a group called ‘allblackcommunity’ with some truly astounding black and whites. Now, although I’ll be posting photos on film, particularly monochrome, as often as I can, I’ll be posting, hopefully more frequently, with pix taken with the iPad. I’ll still be favouring monochrome but I’m beginning with the iPad colour shot above which is not only my favourite taken on the trip but also one of my all time favourites during almost 70 years with photography as a hobby. 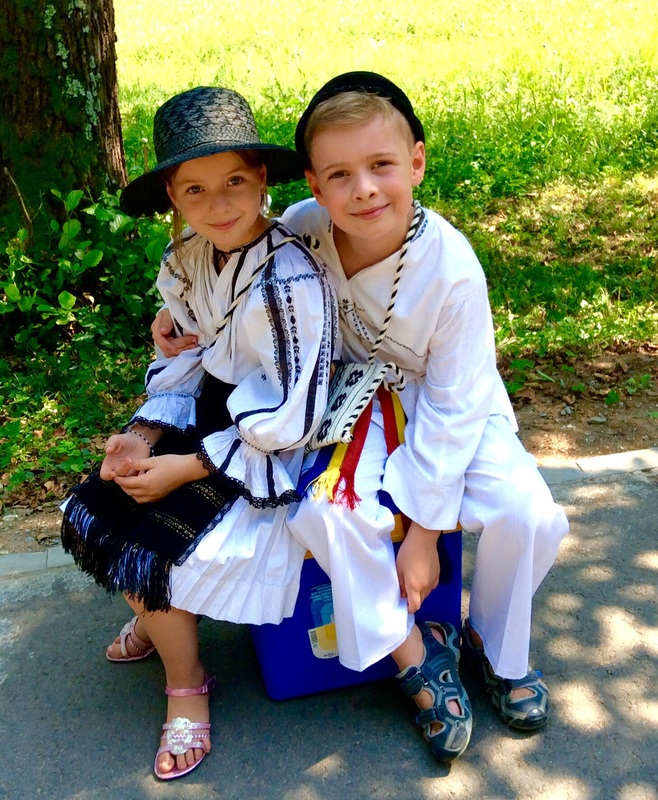 ”It’s the picture of Silviu Gata (with Romanian letters pronounced a bit like ‘Silvyoo Gutzuh’) 10 years old, and his sister Paula, 7, in national costume of the Sibiu region. I spent much of 11 years in Romania working with Romanian children – some with severe learning difficulties, some bright enough to be offered scholarships at both Harvard and Cambridge, many between these extremes – and, for me, this picture shows just why every day with them was such a delight. “The urge to achieve, encouraged by parents and teachers alike, the pride in what they do achieve, the ability to play in the street, to climb trees and all the other ‘pranks’ my generation of children got up to without the interference from the ‘do gooders’ and ‘health and safety gurus’, eating good, healthy ‘natural’ food without fear of heaven knows what pre-supposed ‘allergies’, is what makes them, as the Children’s Society recently found, among the happiest children in the world while “Overall, children in England are unhappier with their lives than those in 13 other countries including Israel and South Africa – only faring better than those in South Korea”. This was no surprise to me, nor to Petronela (my wife) who (as a teacher in the UK) sees the despair of English pupils every school day. “Back to my pictured delightful pair. The ‘coincidences’ continued. The day after the the picture was posted (Petronela posted it before I did) we learned that the children’s mother was the best friend of a university fellow history student of Petronela’s who we had hoped to meet but didn’t succeed – she was taking an exam for her doctorate that day. I’ve still got to resume posts on my other blog, grumpytyke. Maybe soon. I hope you feel better and wish you a complete recovery! Love your blog.